This past spring, I had the opportunity to work with a group of students from Toronto Cartoonists Workshop, led by Ty Templeton, and through TCW's "Fit to Print" course, on a comic book that will be released at FanExpo this weekend. I'm still completely gobsmacked by the whole thing. I've never been to a Con before, so I'm not sure what to expect. I've got an equal amount of thrilled and terrified going on, salted with liberal amounts of "Wait .... what?" The book is Holmes Incorporated, and you can read more about it here. It's two days until preview copies come out, and there will be a formal release party on September 24. Check here for information on how to get a copy of your very own. I got to do the drawings for one of the stories. 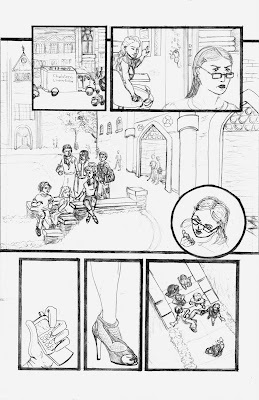 Here's how I decided what to put on the first two pages (you can see the final inked and lettered pages here - scroll down to "Spring Loaded." The first thing I did when I got the script was to write down some notes and decide which panel I wanted to emphasize on each page. Based on that decision, the other panels would all point to it, but would still have an overall forward narrative flow. 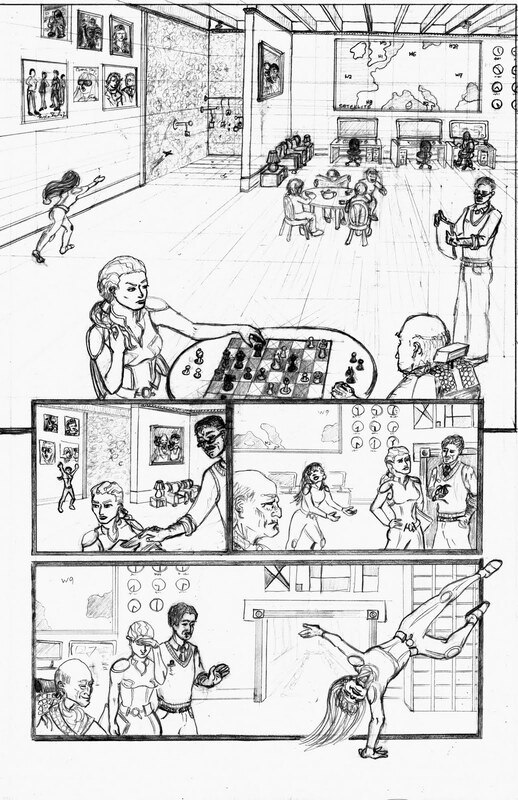 For page one, the key panel was the one where the decision was made to send Trey on the undercover mission, so other than the primary panel 1 to panel 4 story flow, I did a secondary page composition with elements that would draw attention to panel 3, where the decision is made. 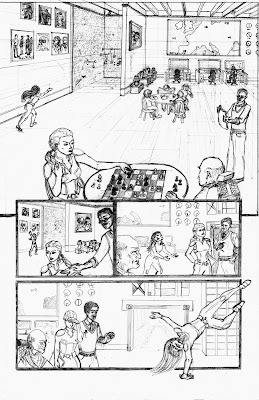 On page two the key panel was the one where the important clues were discovered, so the page composition draws attention to panel 3. But as you can see, I had some trouble otherwise with the panel composition, and there's a lot of weird dead space that doesn't make sense. The artists had weekly meetings to present our work in progress for Ty's review and feedback. My pages, in addition to the aforementioned weird dead space, which also happened even worse on a later page, I hadn't left enough room for dialogue, or made enough variation in the camera angle or distance. So I had another go. 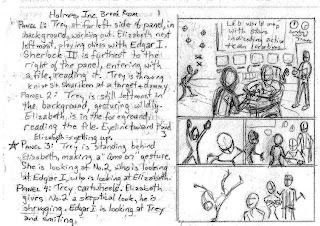 I showed some more of the room in panel 1, added a character who I forgot had a line in panel 2, and moved Trey to the left hand side of the panel to give a lead to the next page, and also to give her room to break out of the panel. She's so excited she can't contain herself, so the panel borders shouldn't contain her either. On page 2, so I decided to remove the medium shot with the clues popped up, and just draw two panels showing the clues themselves, with the character's comments in voice-over bubbles. 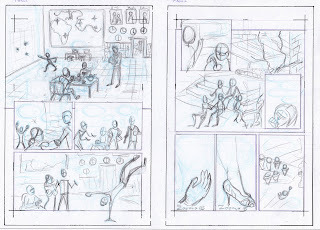 Then, based on more feedback that panel 1 should go back to the foreground/midground/background that my original thumbnails had, I made some final tweaks to the layout when I switched to doing the final pencils. 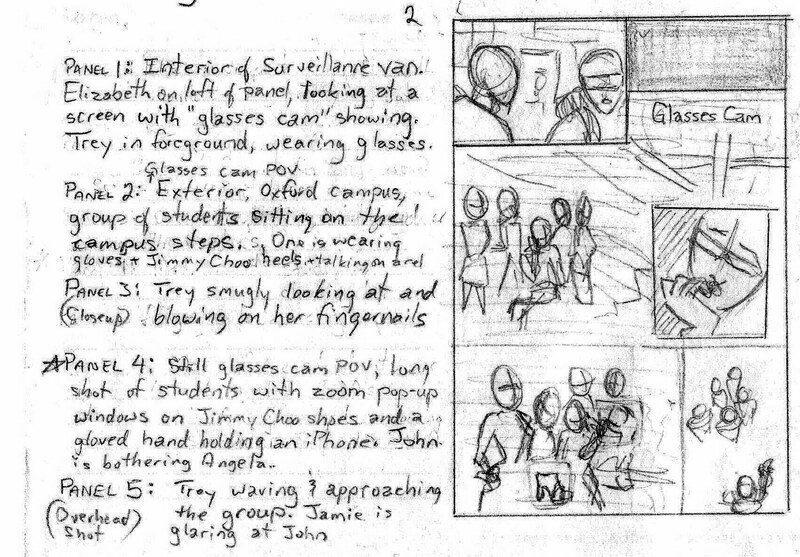 On page 2, I wanted to do fix the dead space problem, which also gave me a chance to add in a quick little establishing shot to show that we were in a new setting, showing the surveillance truck parked outside the campus before cutting to the truck interior and Trey getting ready for her mission. Panel one of the final pencilled page wasn't called for in the script, but I think it supports the story well. 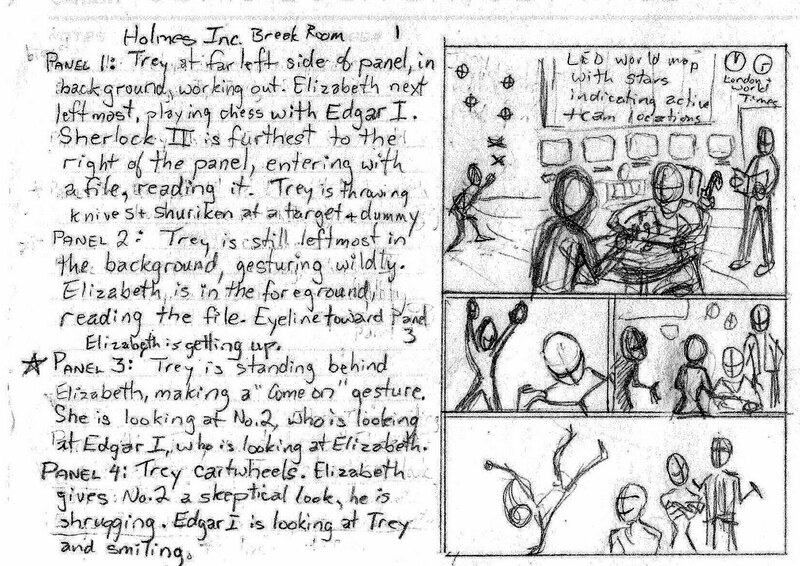 I also remembered the frame rule where cameos should be round, and switched up Trey's literal cameo in panel 3 of page 2. 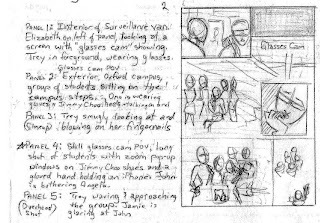 I forgot to draw panel 3 as a view-through the spy glasses which I had in my original thumbnail and layout, but it works anyway. That's kind of all I have for now. My mind is still a little blown. I'm working on getting a feel for the characters in my story so that when I get to actually writing I'll know who they are a bit. So now, for starters, knowing how a guy carries himself, and how he dresses, goes a certain distance to knowing what kind of a person he might be. I'll refine the designs as I develop the characters further, and I've drawn both of the main charcters too short here, but again it's a start. The younger cowboy here has a casual, but prepared for a fight stance. So we can assume he's a bit brash. He's got a lasso but no gun so he's either Canadian or has recently spent time in Canada. (it's the latter.) He's generally clean, but in need of a shave and a haircut. I drew him that way because he's been on the run for a while. The bartender doesn't count for much, because he's just a piece of the set. But if you look closely you can see where I drew his whole figure, behind the bar, to check my proportions and where the floor would go. I generally do that with my drawings anyway - include the bits that are behind other bits when I'm doing my initial sketches. Doing this helps me give a three-dimensional feel to the drawings. The older guy, taciturn, grumpy, kinda stiff (stiff cause of old injuries, not cause of him being stuffy). I'll make sure he keeps the guarded body language and the big, old-guy ears when I do the design tweaks that this guy will need before I start drawing the pages. I started a rough drawing of the lady in the book, but it turned out looking too much like Elektra so I scrapped it. I definitely have to get that stuff locked down soon, though. 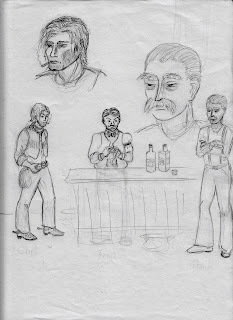 I'm kind of working on the story outline and character designs at the same time here, because each one informs the other. So, that's where we are this week. It's time to do a bit of writing so I'll have stuff to draw, and at the same time to do a bit of drawing so I'll know what to write down. 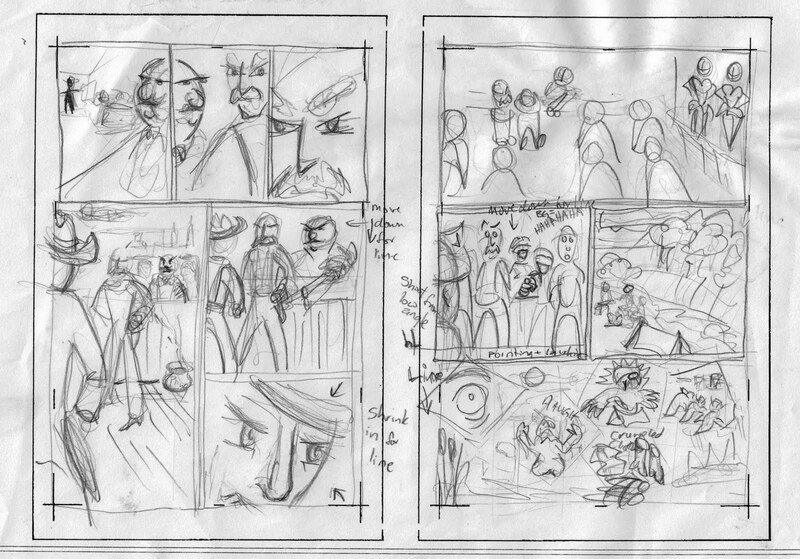 When I'm working on my own stuff, as opposed to drawing something that someone else wrote, I tend to come up with bits of everything at once, so putting down some quick thumbnail sketches helps me focus, and figure out the story beats. At this stage, I'll make notes about what the scribbly lines are supposed to be, and jot down dialogue ideas if I think of some. I don't spend a lot of time on these, and don't worry about how messy the sketches are. 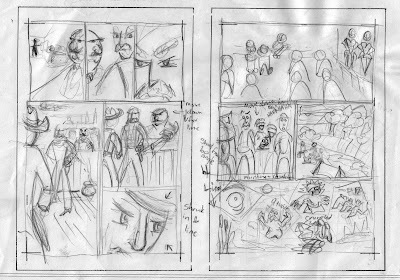 At the thumbnail stage, I'm only looking at the story pace, what the beats are, and how much of the page each story beat will take up. It's a rough draft, with some rough draft notes. And having had a look at it, now I've realized that I'd like to move the two-page spread back a couple more pages and let the bar scene play out a little, and give the otters more time to get from the river to the town. I figure I'll keep the nice, slow mosey pace going so that when the were-otters turn up the slam into action is more deliberate and more exciting. The story beats on page 3 will be spread out across the two new pages. 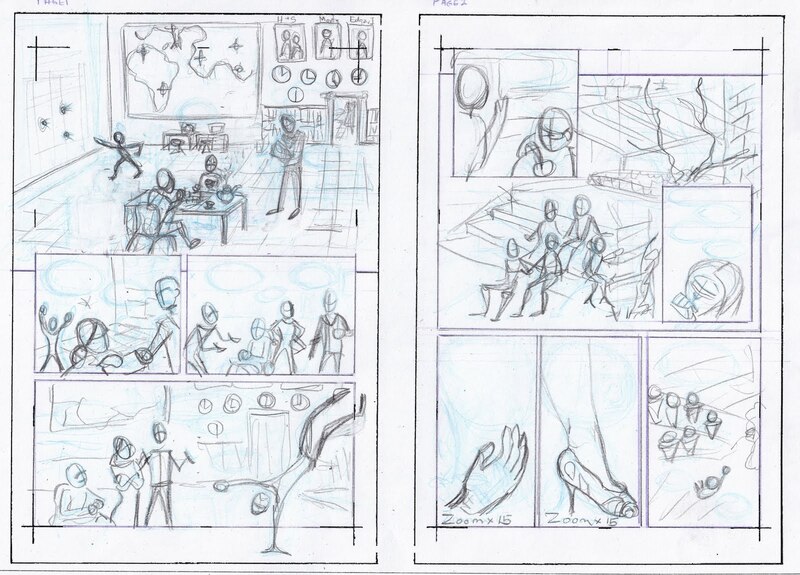 Moving on to the rough layouts, where I start putting some thought into panel and page composition, and camera angles. Page 2 here is pretty much the way I'm going to draw it. Page 3, panels 1 and 2 won't change much. The rest of the page will be completely different. I'll add in some more info and character stuff on the rest of the page. So far, one of my favourite dialogue lines I've come up with will go on the last panel of page 2 and the first panel of page 3. It's my favourite because it gives all the back story you need to know in three sentences. Chet: I never stole them horses. Hank: The whole rest of the county was down to the chapel, Chet. Trixie will never forgive you. Bim, bam, boom, and on with the current story. As soon as I get the rest of the plot points figured out. Here’s the thing. Someone out there on the interwebs saw my sketch of Captain Canuck that I did for Canada Day and has invited me to compete in their Captain Canuck art contest. 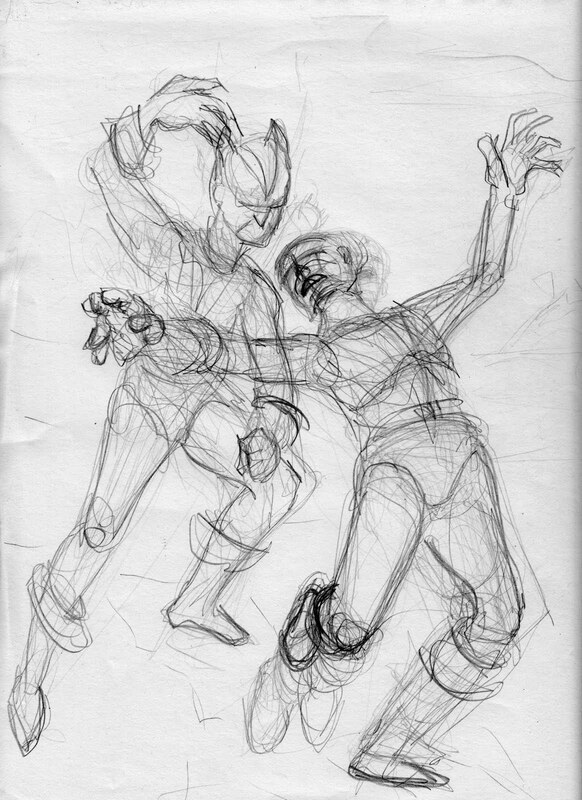 For my competition piece, I wanted to go with something action-y and dramatic, so I’ll be drawing the moment when Captain Canuck realizes that his partner, Blue Fox, is a double-agent for the communists. (Hey, it’s from the 1970s. A lot of villains were communists.) I’ve got the rough layout done on 9x12 paper, and am pretty happy with the basic poses. This week I'll be drawing the same layout onto full scale paper and planning the composition and environment around the poses. I’ll use the other elements on the page to direct focus to the captain’s face, and hopefully will be able to draw an appropriate sense of betrayal and drama in his expression. We’ll see how it goes. Check out the contest at DeviantArt. It’s open to entries until August 15.